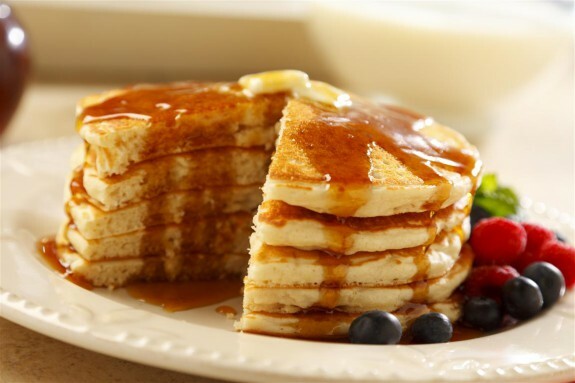 Whenever we have the opportunity to eat pancakes, syrup must play a vital part of the meal. My wife and I have very different techniques in enjoying our flapjacks. I carefully place a glob of butter in between the top and bottom layer and then circle the cake with just enough syrup to touch and flavor each and every bite, occasional adding fresh berries or a little jelly to enhance the experience. And when I am enjoying my last bite, my plate has been wiped dry, not wasting a drop. Now for my wife, there is never enough syrup. When we visit our favorite breakfast place, Bob Evans, even before the waitress is able to land all the saucers and plates of what we have ordered on the table, my wife briskly informs her that she will need more syrup! She enjoys her pancakes totally submersed and wringing wet with the sugary maple liquid we call syrup. It seems as though she should order syrup with a side order of pancakes. And when she has finished, there is still a lake of syrup in her plate, awaiting anything else that she could chose to submerse. Well for my wife and me, we do not associate eating flapjacks without adding syrup! When people get to know you, are you a plain ole pancake without any toppings or are you wringing wet with the sweetness of Christ-like love? In this season of Nativity we are reminded that everything should be covered with the syrup of love! For it is love that God sent His Son into the world and it is love that the Son sacrificed himself for you. You are loved! You have a purpose in this life! Be like my wife’s flapjack, wringing wet with the syrupy sweetness of love covering everything and everybody you encounter in your life with prayerful love, warmth and joy.